You don't think about it while flipping through your Instagram feed, but your social escapades generate a lot of heat. "We now have to decide if we want to position data centers near the arctic circle to take advantage of cooling," joked HP's Martin Fink, CTO and Director of HP Labs during ArmTechCon's keynote Tuesday. He's talking about the heavy footprint of the internet, and how HP's enterprise customers are complaining that they don't have the room or power to meet the needs of the future. HP's solution, of course, is Moonshot -- its low power server technology. Moonshot promises to fill the needs of the information superhighway with less power, less space and less complexity. 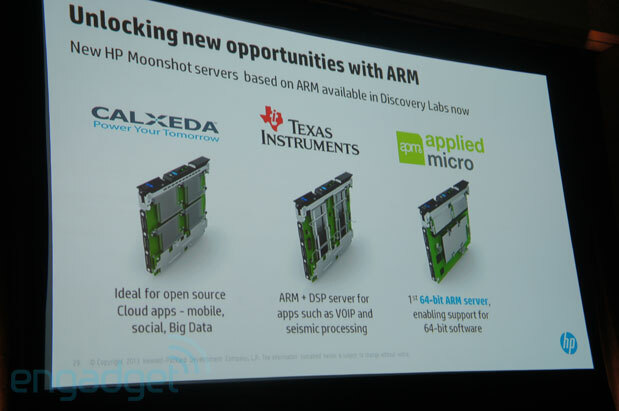 The new infrastructure hasn't seen much play outside of HP's own labs, but that's about to change: the company has announced three new ARM-based Moonshot cartridges, available next year with hardware from Calxeda, Texas Instruments and Applied Micro. The new modules open the doors for your favorite Cloud applications, social networking sites and VOIP providers to make the jump to ARM-based servers, though you probably won't notice anything different if they do. In fact, if you've been to HP's own website, you're already a HP Moonshot user. PayPal, Purdue University and hosting serves like Leaseweb have also bid in on HP's vision for the internet's next-generation backend. It may not be the most visually apparent change in the web's future, but it could be significant one -- and at least HP is betting on its own horse.